In this episode, I talked with Jasmine Sandler about The Importance of Social Branding and its intersection with Social Selling in Delivering Results. I asked Jasmine to start by giving me the deets on how she got to where she is in her career today. Jasmine’s perspective on the intersection between Social Branding and Social Selling, and what she means by that. You’ll hear tips on how to build a successful social brand presence. You learn why Social Branding is for everyone, and your social brand is useful for anyone from Entrepreneur to Executive. Discover how the Social Branding of the Individual Executive supports a company’s brand strength. Jasmine provides tips for executives branding themselves online. Finally, Jasmine talks us through a client case study, so you can understand the process she uses to help people build their brand. Jasmine Sandler is a Google awarded Author, Senior-level Consultant and Keynote Speaker on Online Branding for global organizations and C-level executives. She is the Founder and CEO of Agent-cy Online Marketing, a NYC-based Social Media and Search Agency serving global brands including: CitiBank, Private Jet Card Comparisons, Fly Home Jets, Tuescher Chocolates, Diamonds International, Almod Diamonds and The Shade Store. She writes on SEO and Social Media Strategies for Fast Company, LinkedIn, Entrepreneur.com, SearchEngineJournal.com and ClickZ.com. She has a dual MBA in Marketing and CIS and is a former IBM Marketing executive. Her passions are Speaking, Singing and Hockey. In what is starting to feel like an almost daily flurry of changes, LinkedIn is at it again. On April 14, say farewell to the Products and Services tab on your LinkedIn Company Page. As usual, LinkedIn’s official statement regarding the change suggests that it is all about making life “more simple and efficient for members”, but I’m betting that’s not how Company Page administrators (and that includes me) are feeling about this latest change. First, page administrators have spent countless hours building and keeping fresh the product and services pages for their company. Now they need to download/copy/paste that information to a document and save it. Do it before April 14 or your information is history! Second, administrators will have to build “Showcase Pages”, which are essentially sub-pages of the main Company Page. This information isn’t automatically transferred over, you must manually rebuild them! While the idea of a dedicated page – limited to 10 – for your product or service sounds nice, you have to do the work to recreate them, encourage people to follow the individual pages and dedicate more resources to posting status updates on each individual Showcase Page to drive engagement and traffic to your page. Before you go creating all those Showcase Pages, be sure you understand the ongoing support that will be involved. Third, a key strategy for most of my clients was to secure recommendations from their customers about their products and services. Guess what – recommendations now go by the wayside. Yes, you can copy them and keep for later use but no longer will people see them associated with your Company Page. Ouch. I’m all for innovation and change, but at what point will individuals and companies say enough? User adoption is tough enough even for platforms as popular with B2B sellers as LinkedIn. Constant changes – without warning – put a big burden on people to continually learn new features or recreate their work and time is tight as it is. It seems to me that LinkedIn is taking a big risk in assuming that their members will continue to go along with it all. What do you think? At what point is good, good enough? Is a revolving door on feature changes a good thing? If so, when? This morning, LinkedIn connection Steve Jones directed me to the LinkedIn help forum where there are a lot of unhappy people voicing their opinion about this change. LinkedIn doesn’t seem to care. The decision most certainly is an arbitrary one to delete member data (yes, I know you can save it, not the point). Seems to me that won’t go far in terms of instilling trust that people should use their platform to share their content. Thoughts? Social media has changed business. Today’s buyer looks nothing like the buyers I first met when I began selling 25 years ago. Technology allows them to evade us, block us and downright ignore us if they so choose. It’s a new world, and if you don’t think so, I’m worried for your future in selling. Anyone who reads my blog posts or articles knows that I am unwavering in my belief that WHAT you sell is less important than HOW you sell. For the sales reps who have, to this point, made a pretty good living selling through feature dumps or demos, understanding that the “what” is less relevant now is a tough transition to make. That I keep seeing questions or conversations about how to better “cold call” tells me that we have a lot of sellers stuck in the past. A member in one my LinkedIn sales groups asked if you should leave a voice mail when calling someone you don’t know. Group members actually debated techniques…yes, no, phone number in the beginning, compelling pitch in the beginning, phone number at the end… really? Instead of trying to improve upon an outdated mousetrap, get a new one. Change is needed and it isn’t simple. 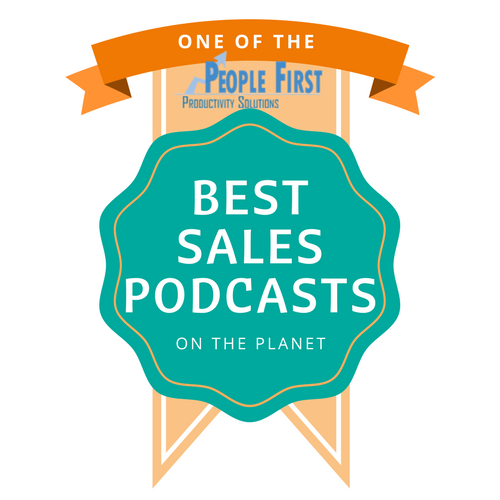 I follow a number of highly regarded leaders in sales. 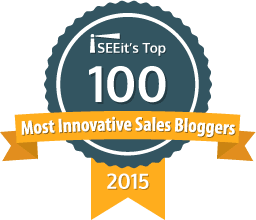 One of those leaders is Tamara Schenk, who writes an excellent blog that you should follow. Her recent post on the difference between simplification and simplicity is brilliant. It crystallized for me what the problem is related to the thundering din that is social selling. In their attempts to make social selling sound simple, the usual suspects have created a loud, confusing mass of noise that leaves sales leaders either completely confused – OR – they mistakenly assume, because that’s what they’ve been told, that if their sales people just follow a prescribed set of steps, their sales challenges will dissipate. Are there tactical elements that typically lead to success when using social for selling? Of course. Will they work for every seller, in every industry the same way? No. Should you even start with tactics in the first place? Absolutely not. You see, that’s the biggest gripe I have regarding the chatter that largely surrounds social selling. It is surface at best. The message has become… just deck out your LinkedIn profile, send InMail to the prospects on your search lists, Tweet the content of industry influencers – so that they will one day reciprocate – and share a few blog posts… boom, you are now a social seller. The top of your funnel will magically fill up, decision makers will scramble to clear their calendars to see you, and deals will close in no time. You wish. If it were easy, everyone would be doing it and succeeding. Social selling is not simply about adopting a new set of “tools”. Success requires developing a new mindset related to selling entirely. A change is required in attitude, approach, process and skill set. Change is tough, it can be messy, and it is painful in the beginning. Leaders must think holistically about what needs to change, what they have to work with – people, tools, process – and what they need that is missing. I’m not saying don’t give sales people LinkedIn training, but I am saying that isn’t the first place to start. And if that’s all you do, expect limited results. You’ve probably noticed that LinkedIn continues to make changes to the platform. There are so many rolling out – and at various times with no real warning (except if you read their blog) – that you might be having trouble keeping up. In an earlier post, I talked about changes to the navigation structure, which you can read about here. 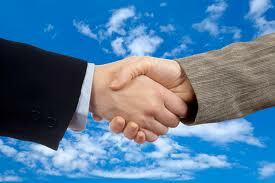 The sharing of content is a core component of today’s social selling strategy. Visibility counts, as does being able to demonstrate that you are a thought leader in your field. But how do you know if anyone is actually paying attention to what you are sharing? Well, now you can. 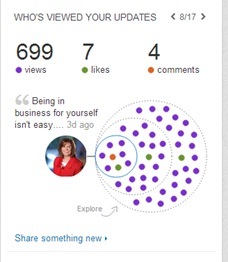 LinkedIn provides you with the ability to monitor how well the content you share resonates with your audience. On the home page, you find the feature in the right sidebar beneath Who’s Viewed Your Profile. Quickly, you will be able to see the number of people who Viewed what you shared, who Liked the content or who added their Comment. Pretty cool insights to help you determine quickly what content works and what doesn’t. You can also scroll back through prior updates to compare numbers against prior topics. Unified search is the term used for a streamlined way to search the information on LinkedIn whether it is People, Companies, Groups, Jobs or your Inbox. You don’t even need to select the drop down arrow to the left to select your topic. As you can see in the picture, I typed in the word “sales” and those things that are related to sales pop up in an ordered list. As happens when changes are made, some features are gone that you may have liked. If you were a fan of searching Updates AKA Signal to find content that others were sharing quickly, you’ll be disappointed to know that – for now anyway – that feature is gone. I’ll keep you posted if that changes. To see more details on the rest of the changes – CLICK HERE! Sales leaders are often quite puzzled when it comes to making social selling work for their sales organization. Who can blame them? Ask 10 people who promote their expertise in social selling, and it is highly likely that you will hear 10 different definitions of the term. Listen closely and many of the pundits are simply telling you that all your people need is to use LinkedIn. Not the entire story! I have defined “social selling” as the process of using social media to network, prospect, research, engage, collaborate, educate and close all with the purpose of attaining quota and increasing revenue. 1. Gaining access to prospects is much harder these days. Buyers just tune out your cold calls and broadcast emails. Even a recognized brand name doesn’t guarantee a sales meeting these days. 2. The decision making process in most companies is much more complex. I read somewhere that on average there will be 12-15 people involved in the purchase decision. Sales people need to build relationships with multiple influencers and sometimes it isn’t easy to tell who those key influencers actually are. 3. Getting a meeting at the C-level doesn’t necessarily move your solution to the front of the line. Yes, you should definitely set your sights on securing a meeting with the right decision maker at the highest level that you can, but you are fooling yourself if you think that the gal at the top isn’t going to involve her people in the process. 4. Social networking tools like LinkedIn, Twitter, Facebook and more have entered the mix. Sales people need to understand how social fits the sales process, but they also need to learn the nuances of participating in a social environment where there are unspoken rules and generally accepted best practices when trying to engage someone in the socialsphere. If you don’t know what they are, you will make a misstep that could be costly. Adopting a social selling approach is about change and change just isn’t easy. It also takes time. It takes setting a STRATEGY, ensuring that sales people have the right sales and technology SKILLS and that EXECUTION of the strategy is happening consistently. On Thursday, July 25 @ 1pm Eastern, join me over at Top Sales World Academy for a FREE educational session about what it really takes to Solve the Social Selling Puzzle. REGISTER HERE! By the way, there are other educational sessions being conducted by some of the best in the field of sales!